We are really excited to be part of the Four Walls Hunt – a hunt all about home and garden stuff. Founded by Valena Vacano of Casa de Smurf, hunters can expect to find lots of lovely things from well-known brands, as well as lesser known ones. Our offering* to hunters is a set of four pieces of 3-dimensional wall art, which include a removable resizer to ensure a fit for most spaces. 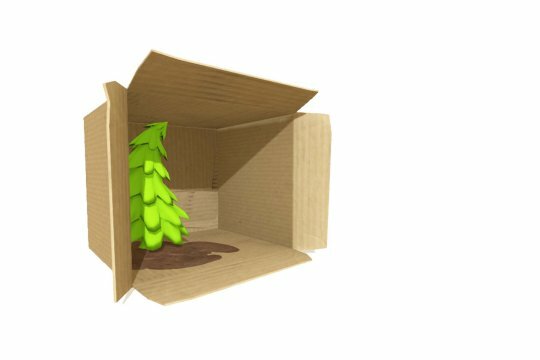 Choose from Pine in Winter, Spring, Summer or Autumn. At default size, each piece weighs 2 LI. * Please note that each item in the hunt is priced at 20 L, and has a stated value of 200 L or more, as well as being brand new for the hunt. 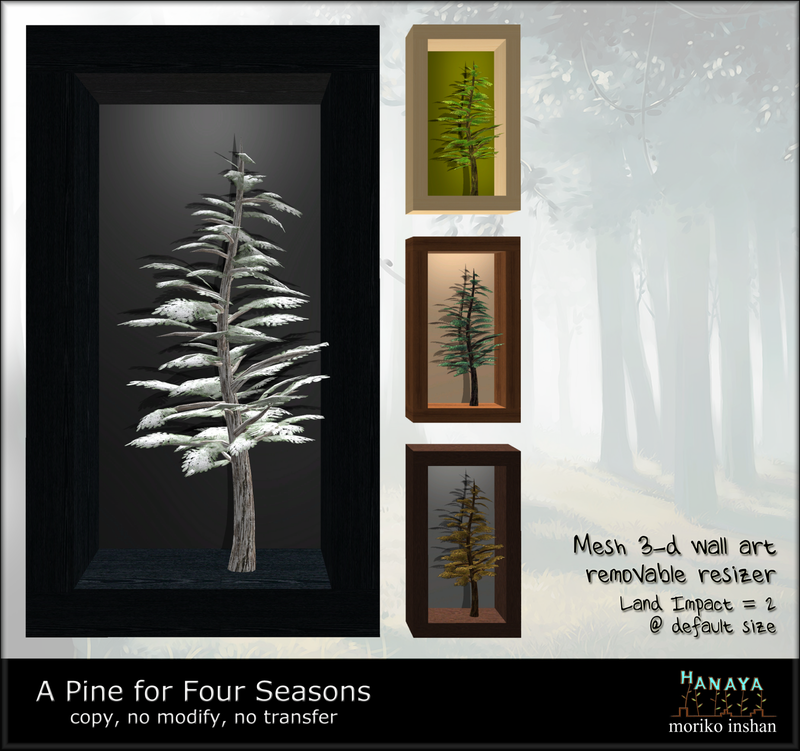 This entry was posted in Events, Freebies and Gifts and tagged -Hanaya-, Four Walls, hunt on January 16, 2013 by moriko. The Cold Winter Nights Hunt starts in less than a week, and the -Hanaya- team is very happy to be participating. As always, we are inspired by our real life activities – this time by star watching. The cold, crisp nights of winter are perfect for grabbing a few friends, heading away from the city lights and setting up a telescope for some sky-watching. And to make finding objects in the sky easier, we use a telescope with a motorized mount, which is connected to a laptop. Using an application like Stellarium, it is easy to select an object on the monitor (like a star or planet), then pressing the telescope Go-to key to guide it to the object. To give our friends and customers a chance to do some star gazing in Second Life, we have put together a mesh star watching kit as a gift* for the Cold Winter Nights hunt. The set includes a telescope, as well as a laptop with cable, folding camp table and of course an astronomy reference book. 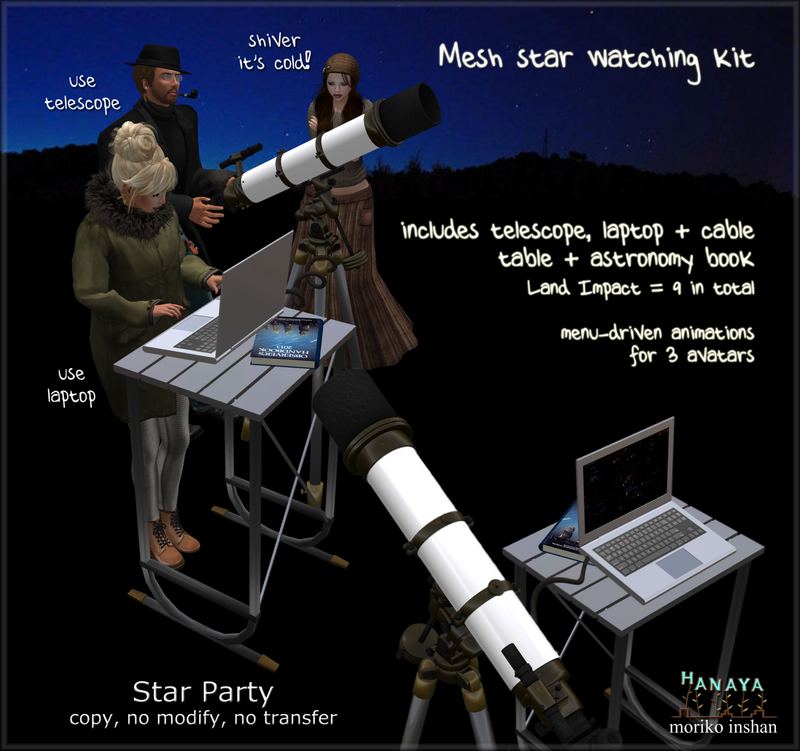 The pieces (with the exception of the telescope) were handcrafted in our mesh workshop specifically for this project. The set includes six built-in animations for simultaneous use by 3 avatars, to allow you and your friends to watch the sky, operate the laptop and stand around shivering, waiting for your turn. The animations are adjustable for height and rotation, and do not require poseballs. And yes, you can see the sky when you use the telescope! The Cold Winter Nights Hunt starts on January 15, 2013 and runs until February 15th. * Please note that all gifts in this hunt cost 10 L each. This entry was posted in Events, Freebies and Gifts, Product Announcements on January 10, 2013 by moriko. The -Hanaya- team is back from a refreshing holiday break, ready for a great new year. And to start the year off right, we bring you a cute little January 2013 group gift. When you were little, did you ever imagine that you could shrink down and walk into the pages of your favourite fairy tale? Do you remember the wondrous illustrations of adorable little old-world cottages set in a clearing in the woods, with welcoming lights at the windows beckoning you to come inside? 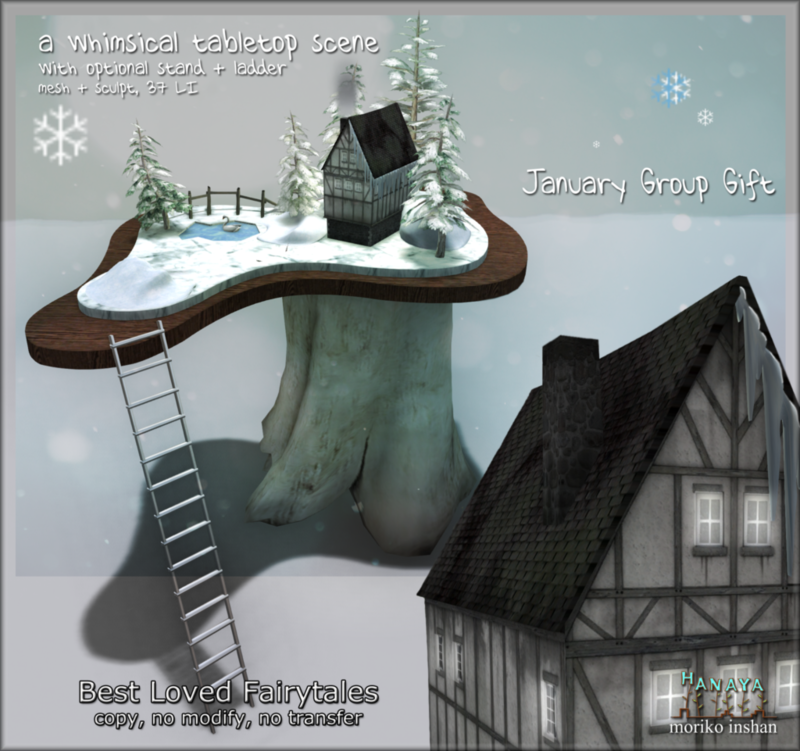 This month’s group gift for the members of the -Hanaya- Yummy Collectibles in-world group is a whimsical tabletop scene* inspired by darling houses from fairy tales like Cendrillon, Tom Thumb the Little and Princezna se Zlatou Hvězdou. -Hanaya- Best Loved Fairytales (Winter) is a lovingly created and textured blend of mesh and sculpted elements, which can be placed on an existing table, or used with its complementary driftwood stand. And don’t forget the ladder, so your littles can have access when you are sleeping. The gift was sent out on the -Hanaya- Yummy Collectibles in-world group today (4 January 2013). If you missed yours, either get it from group notices or stop by our in-world store. The gift will remain available to group members in the Customer Service area until the end of January. Have a lovely sparkly wintery-white and bright weekend! * Decor item only, not intended as a livable house. This entry was posted in Freebies and Gifts on January 4, 2013 by moriko.